Product managers and leaders can have a dramatic influence on an organization. Our influence extends beyond the revenue generated by the products we help create. We have an uncommon perspective in organizations as our work requires significant cross-functional interactions and knowledge of other functions. The combination of our capabilities and experience means we should be part of transformations in our organizations, improving what is in our sphere of influence from our group to the entire organization. [2:18] What was your experience at Lowe’s Innovation Labs? The main question I tried to answer was, how do you get people to understand the future and then do something about it. I needed to prove out the theories I learned in academia as a behavioral economist. The myth of innovation leads large companies like Lowe’s to believe they can’t behave like a startup. My goal was to figure out how they could do that. I started at Lowe’s running international marketing research and eventually worked my way into innovation. [4:56] What were some of the innovations you led at Lowe’s? There was the infamous “Lowebot,” an autonomous robot that speaks multiple languages and then helps you navigate through the store while doing inventory analysis along the way. It didn’t take off in the U.S., but I got emails from people who said they joined the company because they saw what we were doing and wanted to be part of it. [7:15] How do you see the relationship between transformation and innovation? Everything has an experimental design aspect. We ran different versions of the book title and subtitle in front of people and saw that it was a little played out. 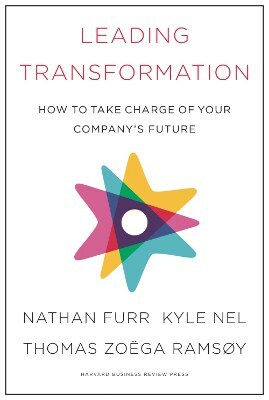 The book was really about small transformations in a team or department that leads to larger scale change. [10:45] How do you use science fiction to envision the future? Steve Jobs read a lot of science fiction and Elon Musk talks about it at length. We thought we could do it in a systematic way and use it as a way to help people see the future, much in the same way as I use tools to help me with accounting or other things I’m not good at. I’d seen in my academic work that stories are the only way people can understand information and be motivated enough to do something with it. I love science fiction because it’s forward looking and assumptive — much like strategic forecasting. I brought in science fiction writers and turned strategic brainstorming sessions into comic books about the future of the company. Once they got past the newness of it, they were able to envision the future in a concrete, tangible way. [13:16] How does innovation differ at a large organization and a startup? The mindset at a large organization is typically one of mitigation and stabilization, while the mindset at startups is disruption and making the most of change. This mindset is the one big advantage that startups have and there’s an opportunity to bring that way of thinking into larger organizations. I usually start my work with companies by saying that this is their call to adventure. If more people embrace that mindset, the future will become what we want it to be. [19:52] How do you navigate the unknown? Initially, your focus should be on your executive team or your decision makers so you can actually get something done. You’ll never get to your customers if you can’t get through your internal team. One of the things I look at in the book is the difference between the formal decision making process and the “black market’ process of how things actually get done. Almost always, conflicts arise when those two don’t match up. The company’s lawyers and I had very different views of what it meant to be the company’s caretaker. Once I realized we were coming from different perspectives, I started to change the way I framed issues and giving examples of ways that companies got into trouble when they did not take risks. The people who were against me at one time ended up becoming my closest allies at work. [26:17] How can we apply these ideas to our own personal transformation? I encourage people to consider their sphere of influence and how to push the boundaries. Once you start to transform yourself, you transform the group. If you just focus on your current job, it will feel like the world is collapsing in around you. The more I pushed those boundaries in my own sphere of influence, the more I started to gain credibility and become known as the innovation guy. You can go through anything if you have that larger purpose in mind. The more you do it, the better you will be at applying the storytelling framework to gain even more buy-in for your ideas.